Never judge a book by its cover and never assume all pubs serve the standard fare should be the new saying of this century. H&T Gastropub’s impressive menu exemplifies this. H&T Gastropub is a place where good conversation is accompanied by cold beer, a game of darts and of course, a satisfying meal. 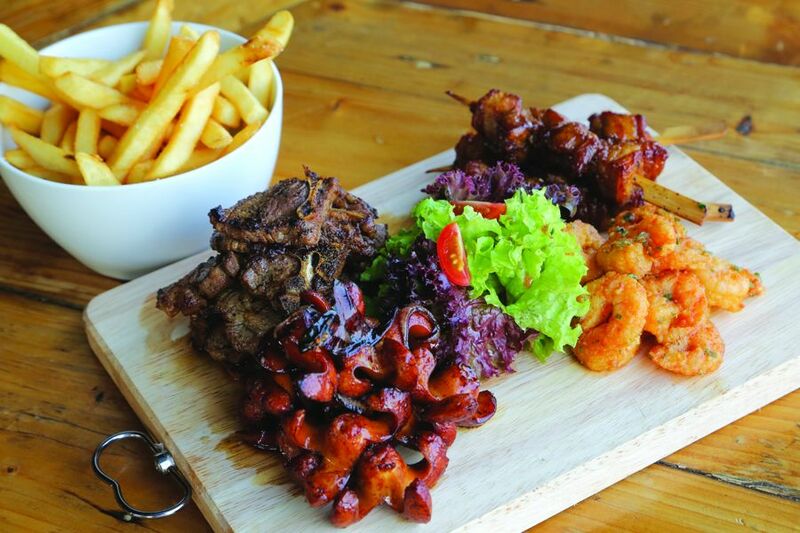 In its recent visit to H&T Gastropub, Top 10 of Malaysia gets to enjoy a hearty meal and more. 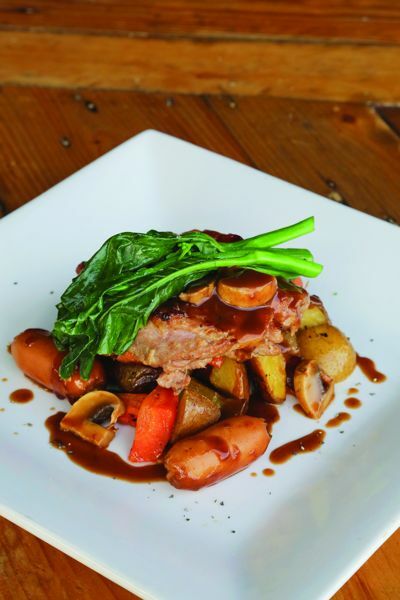 When one drives into the vicinity of H&T Gastropub which is tucked nicely in a corner in Seapark, Petaling Jaya, the feeling of relief is immediate with the sight of an ample parking lot. There is no hassle at all in finding a good parking place. Then friendly servers’ greetings follow and before the menu is presented, the creative chalk sketches on the black wall grabs one’s attention. H&T Gastropub is a one-stop entertainment and gastronomic (as the name suggests) establishment. The entertainment component comes in obvious as customers take aim and throw darts at the electronic dartboards, with classic rock and roll and some contemporary songs being played, and big screen televisions providing a backdrop. Food wise, diners have a variety of choices but some highlights given here can very well serve as starting points. The nutty-tasting arugula, firm tomatoes, a multitude of designer leaves, crowned by smoked salmon is enhanced by a classic dressing of balsamic vinegar and olive oil. This is not a mere entrée but a meal itself as the portion is generous with a variety of choices to boot. The fried shrimps wrapped in a batter of flour and egg (fresh and salted) provides crunch and depth of flavor. Pork chunks on skewers, part lean and part fatty, is marinated to perfection, melt in the mouth, and at the same time resists being the star of the H&T Beer Food Platter. 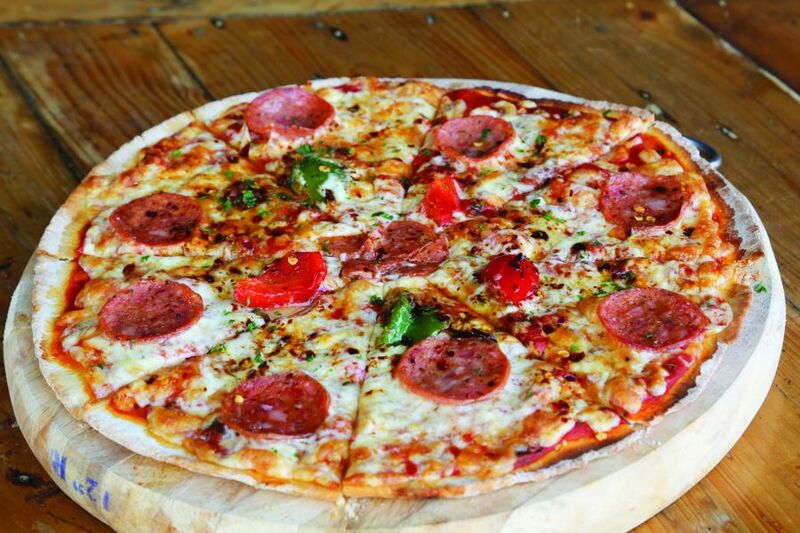 Thin crusted and topped with cherry tomatoes, pepperoni, ooey-gooey mozarrella cheese and a spicy marinara sauce, the Divola Pizza is sufficient to give 2 persons a satisfying meal. As one can probably tell from the name itself, the pasta contains magret du canard (roughly translated to duck breast). The magret du canard is smoked, hence the rich flavors of the duck is infused with the fragrance of wood smoke. 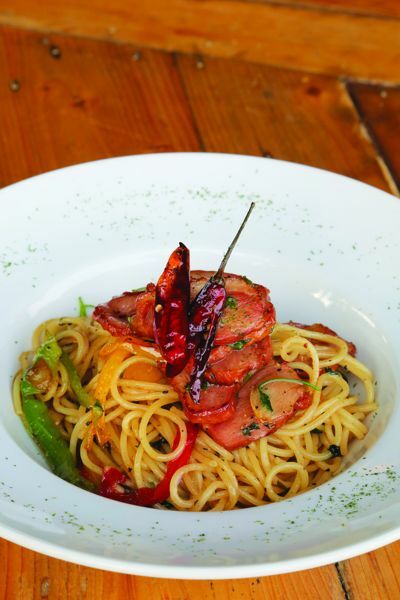 The spaghetti is nicely cooked with garlic, olive oil and a host of Italian herbs. This meat dish is both a feast for the taste buds and the eyes. The surprisingly crunchy buns envelopes the succulent patty which is made of freshly ground beef that is not overcooked so that it remains juicy. Pickles, tomatoes and a spicy homemade tomato salsa complete the dish, making it a true savoury delight. The best of both worlds is incorporated here – the robustness of the west and delicateness of the east. The chicken is roasted to perfection without it being dried out. Home-made gravy whipped out of herbs complements the roast and provides a delectable finish to the dish. The Asian influence here comes in the form of the Chinese kale (kai lan) and together with caramelized carrots, roast potatoes and also sweet potatoes, make the dish an unforgettable delight. Downing a cuppa of this invigorating preparation is simply refreshing after the hearty meal!